Don-Jo 6in. x 9in. A.D.A. 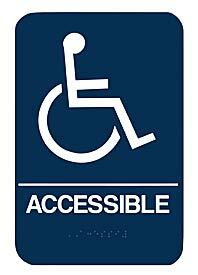 compliant "ACCESSIBLE" (Wheelchair) Sign features raised white lettering on a blue background. Includes braille translation. Fasteners: double sided pressure sensitive tape.